London-based Nigerian man and his brother-in-law have been jailed for a total of 14 years for their part in a 25 million pound internet fraud involving victims from 55 countries. 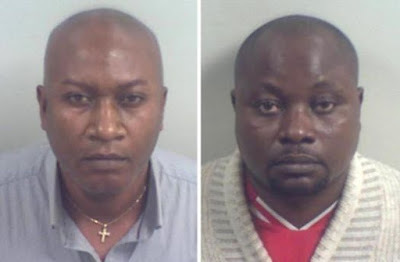 Emmanuel Adanemhen, 50,(left) and Eduwu Obasuyi, 40,(right) pleaded guilty at Maidstone Crown Court to their part in sophisticated fraud and money laundering scams, which in some cases targeted the elderly and vulnerable. A Kent Police spokesman said that Adanemhen arrived in the UK as an asylum seeker in 1998 and had assumed the identity of a deceased Portuguese man by changing his name by deed poll and on driving licences. The fraudster then used the fake identity to open bank accounts to launder funds from bogus schemes, which included dating website scams, false inheritance scams, overseas lottery wins and shipping frauds. Police were led to Adanemhen after they apprehended Obasuyi, of Friern Road, East Dulwich, who was arrested as he was about to board a plane from London to Lagos, Nigeria. Detectives found that the two defendants had moved more than £4 million through their various accounts, which had come from victims in countries around the globe, including Germany, Norway, Switzerland, New Zealand, Canada, United Arab Emirates and across the USA. One elderly victim from Florida was conned out of $2.9 million, while police estimate the total victims have been conned out of to be more than £25 million. Adanemhen admitted to conspiracy to defraud, conspiracy to enter into a money laundering agreement and three counts of fraud against the Home Office and the DVLA, which related to his fake documents. He was ordered to serve seven and a half years in jail.Obasuyi pleaded guilty to conspiracy to enter into a money laundering agreement, and was sentenced to seven years in prison. "This was a highly sophisticated criminal enterprise with Emmanuel Adanemhen and Eduwu Obasuyi at the heart of operations. "They were undoubtedly highly placed and trusted individuals, handling and moving millions of pounds obtained through devastating and cruel frauds played out on sometimes very elderly and vulnerable people."